Do you love to walk your small-sized dog at night? Well, walking your pup is fun and fulfilling. It also has its downsides and challenges as well. 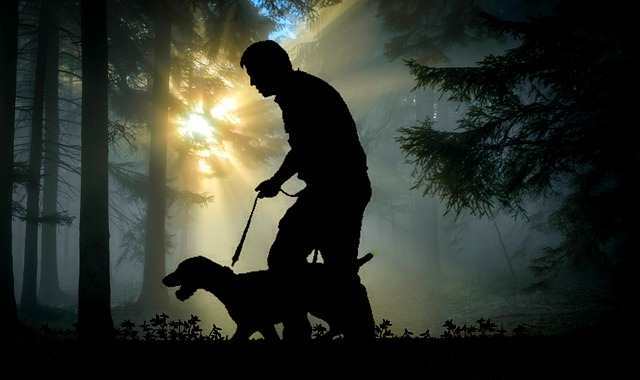 When walking your pup at night, you need to ensure that you are exposed to minimum safety risks. 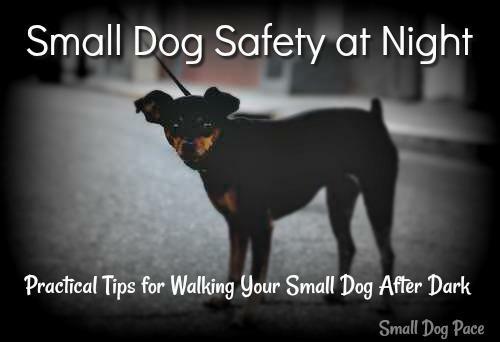 Keeping in mind a few basic safety tips for walking your small-sized dog at night will not only ensure that your canine is safe, but will also make the walk hassle-free. These safety tips are wrapped around the main idea of getting specially prepared for your nighttime walk with your small dog. What I love about these safety tips are their straightforwardness and practicality. Ensuring that you stay visible throughout your walk means that other pedestrians and car drivers get to see you with ease. When you and your leashed canine go about your step unnoticed, you become vulnerable to speeding cars, cyclists, riders, and other pedestrians. With the modern technology, it is easy for you and your small dog to stay visible at night. A variety of dog supplies present in the market can light up to make you and the dog more visible. To help your pup stand out in the dark, get an illuminated harness, collar, and a retractable dog leash. If your dog leash lacks a reflective material lining, you can add a safety necklace to it to help your pet glow in the dark. A retractable dog leash is especially an excellent tool for walking your dog at night. This type of leash allows your dog to roam around and sniff stuff as a way of enjoying a bit of freedom as you walk. A retractable dog leash features a comfortable handle while its brake buttons make a nice feel in your arm. Small dogs tire easily out of walking. Keep the walk considerably short to avoid cases of hip dysplasia which are common among small dogs. A harness for your pup would mean lesser pulling and thereby chances of hip dysplasia. The harness should offer 360-degree protection for the dog. What I love about a dog harness is the fact that I remain in control over my dog while keeping her visible and safe. As you go out, you are likely to face two things – cold weather and darkness. Therefore, it is crucial to dress appropriately to counter the cold and dark. When walking your dog at night, both you and your dog are at risk of not being unnoticed. Therefore, do not forget to ensure personal visibility at the expense of lighting up your canine. As a rule, avoid dark clothing if you must take your dog for a nighttime walk. I recommend a reflective vest on top of your walk clothing. You can also settle for reflective and light-colored clothes. This form of dressing helps you to stand out in the dark, and you are easily visible. White or yellow clothes with reflective stripes are especially my favorite. What about your canine? Does she need warm clothing? For those residing in colder climates, you already understand the need to dress up your small dog for warmth regularly. However, at other times, the temperatures could be considerably warm during the day, and we might think it is favorable for our furry companions at night. Small dogs find overly high as well as low temperatures quite intolerable. The temperatures tend to go down at night, and you can feel the difference once you step outside. Do not let your small dog suffer in the cold. Notably, your pup must be kept warm during nighttime walks since her coat is thin and short (1). Ensure to keep your small dog for a maximum of 15 minutes when the ground has noticed. During winter, dress her in comfortable winter boots to discourage her toes from being frostbitten. I have a particular liking for reflective dog jackets and vests. These carry out a double-duty – they keep my canine warm throughout the walk in the cold of the night, and they ensure that she remains visible during our nighttime step. Here is a couple of suggestions for reflective gear which keeps your pup safe and warm. Depending on your neighborhood, you may come across a whole night creature host as you walk at night. Your dog will certainly want to chase after or run away from different night creatures. As a result, your pup might try to pull and yank your arm from the pocket’s comfort. Worse, your small dog might want to stage a fight with some of the night creatures like a raccoon. Notably, some of these night creatures might harm your canine. Therefore, it is advisable that you keep your pup restricted by a retractable dog leash. The leash will help you control your dog’s movement and possible move after a night creature. As you prepare for your nighttime walk, be sure to research on the possible wildlife you may meet as you walk at night. In most cases, coyotes and raccoons are a typical appearance. Other night creatures you need to be cautious of are wild cats, opossums, and toads. These night animals trigger dog anxiety as they might scare or stress your dog. If your dog barks excessively, that signify dog anxiety in your pup. The most significant concern with these night creatures is not a mere distraction. These animals could be carrying diseases which could be fatal to your pup. Prepare adequately on how to keep yourself and your small dog safe if you come face-to-face with such night creatures. You can stay safe by ensuring that your pup is restricted to a retractable dog leash that is reflective to scare away some night creatures. You may also change your route and take a safer path. The fun of your nighttime walk with your dog also derives from the ways you choose. Therefore, it is essential to review the tracks to follow. Arguably, some paths will be more fraught than others. Taking twisty routes which are desolate might result in some undesirable aftermaths. You could get lost in the dark if you take a path you are unfamiliar with. It is also possible that you may run into some unexpected thing or night creature. For the safety of both you and your pup, make sure that you avoid neighborhoods known for high crime rates, trails, bumpy places where you might trip and fall, or other unfamiliar trails. These places might be difficult for your small dog to walk on. If your dog is little, especially if she is a brachycephalic breed, she could be subjected to panting and open-mouth breathing which increases her vulnerability to respiratory complications common in small breeds (4). 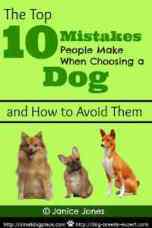 Just stated, sticking to familiar paths is in the best interest of both you and your canine. While there is no recommended time for you to lose track and your small dog to get missed, it is undeniably more dangerous when you get lost in unfamiliar territory with your pup running loose while taking a nighttime walk. Taking familiar routes means minimal chances of getting lost. It also implies minimal contact with night creatures and minimal respiratory complications for your pup. Reflective gear on you and your pup is not sufficient to keep your way lit. You might come into spots with no street lights, and you might need to supplement the visibility of your path using a rechargeable source of light. A rechargeable headlamp comes in handy as it lights up your way while leaving your hands free to hold the dog leash. You may also carry your phone to light up your path when necessary. In addition to lighting up your way, the phone could be a life-saving tool in the event of an emergency. Therefore, ensure that your phone is fully charged before you go out. It is recommended that you keep your vet, emergency police, and taxi service contacts for fast emergency services. You may also benefit from additional features including pet phone applications for safety and fun. Turning off all possible distractions is another excellent way of having a safe and fun-filled nighttime walk with your pup. Give your canine your undivided attention at this time to ensure optimal safety. It is tempting to chat your friends up, talk over the phone, or even listen to music while walking your dog. While this makes the walk more pleasurable for you, it potentially increases the risk of your pup getting hit by riders, cyclists, or even car drivers. Night creatures could also attack your dog. This means adequate preparedness to take note of oncoming bikes, cars, people, and even animals. Having split attention could mean reduced alertness. If you use your phone or listen to music as you walk your dog, there are chances you could trip over and fall, or even risk your small dog as you might fail to notice cars, passers-by, and other animals. Leave the headphones at home, and keep your phone in the pocket unless you need to use it urgently. With minimal distraction, you get to focus on your small dog and spend quality time together. The nighttime walk is so beneficial to your pup, and you need to give it all your attention. Mainly, small breeds are known to be vulnerable to depression, chewing, and play biting. When you pay attention to your small dog during your nighttime walk, you help her overcome these mental issues. You now know the essence of preparing adequately for your nighttime walk with your pup. Ensuring that your canine is on a retractable dog leash, a pet collar, and a harness enhances your control over the dog. Warm and reflective gear helps to counter the cold and problems of frostbitten toes and respiratory disease development common among small and brachycephalic breeds. Preparing for night creatures keeps you and your small dog safe. Also, sticking to familiar paths ensures that you do not lose your way at night and plunge into unknown territories which present unprecedented risks. An extra light source means that your path is lit throughout. Avoiding distractions further implies a total focus on your dog to keep her safe and relieve her of mental issues including dog anxiety, chewing, and depression. These tips will make your walk fun and safe. With these tips, you are ready to take that much needed nighttime walk with your pup. 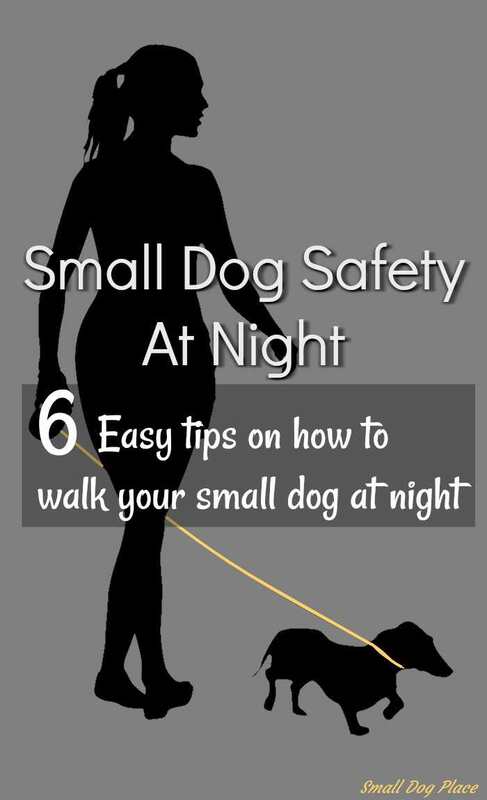 Small Dog Safety At Night Pin: 6 Easy Tips on how to walk your dog at night. Ruby is the proud owner of Pet So Fun. She is also responsible for the abundant content creation on the website. She knows that there are millions of pet owners looking for the right kind of information online. And this is where her expertise lies. 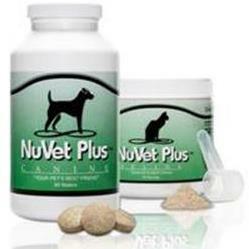 Smith writes about pet care health and fitness along with the best pet product recommendations. 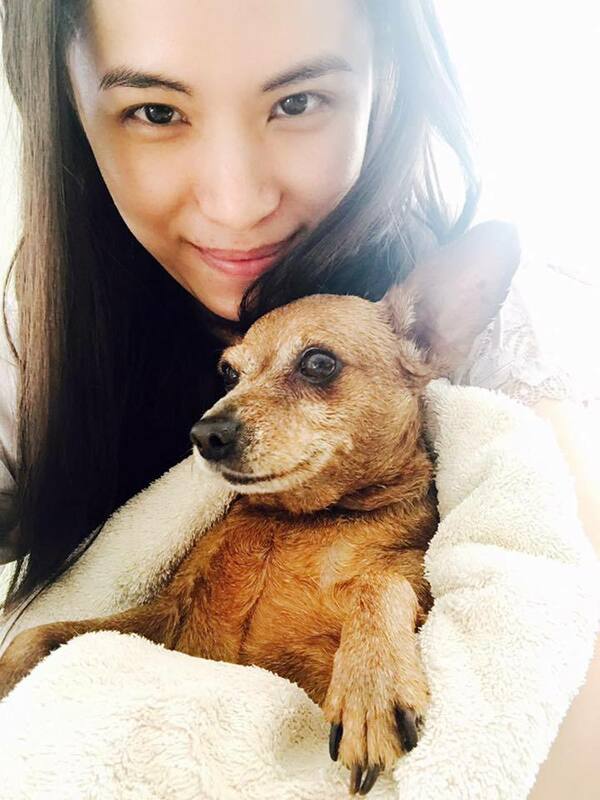 There is nothing on her blog that doesn’t encourage others to create a healthy and friendly environment for their pets. If you found Small Dog Safety at Night Helpful, may we suggest a couple of our other safety-related articles.